ARC Wrap: Brothers Glen and Matt Raymond take their first stage, Heat, and round win in a tough ARC Quit Forest Rally in Western Australia. A new championship contender has been revealed in the Quit Forest Rally in Western Australia; though anyone who has followed brothers Glen and Matt Raymond in their short ARC career will not be too surprised. With Queensland co-driver John Allen at his side, Windus campaigned the spare Bates Toyota S2000 Corolla, previously run by Simon and Sue Evans. The latter, fresh from the last round win in Canberra, headed up the leaderboard in their new Mitsubishi lancer Evo IX ahead of Bates and co-driver Coral Taylor in the other S2000 Corolla. Not surprisingly, the cocktail of experienced drivers and rising stars made for exciting, if dusty, rally viewing. The two privately-backed Bates S2000 Corollas flanked Simon Evans in the results from the first stage, but both Bates and Evans fell victim to the harsh WA roads. A steering failure scuppered Bates, while Evans broke the gearbox and Herridge had problems with his Subaru STi's clutch. With three big names out early, the Raymonds and Windus were left to fight for the lead. A wayward rock deflated Windus's charge; the resulting flat costing him almost a minute and leaving Raymond in the lead. Eli Evans claimed second with a careful drive in the spare car - he spectacularly rolled out of the last Canberra round - with Windus eight seconds clear of Justin Dowel and Matt Lee's Evo IX. "On Ferndale (SS8, where they won by 19secs), people were asking us where the shortcut was!" said driver Glen Raymond. "It's our first ever ARC win, so (we're) really happy. "Having claimed the podium finish in the rally of Canberra three weeks ago the team went one better today, I hope we end up with the same result tomorrow!" In Heat 2, Windus and Bates traded blows with both Evans brothers throughout the morning, as the Raymonds suffered a steering arm issue and were late into time control and penalised 15secs. Herridge found some pace with a second-fastest time on SS14, but he was trounced by Windus by 7.7secs. But Windus's lead came to a crashing halt just 1km from the en of SS16. "The car was getting quite messy at that stage, very loose, and I was thinking that's unusual for that sort of car," said co-driver John Allen. "On the outside of this corner there was a stump and we hit it. Then the Raymonds came around the corner and ran into the back of us. Matt told Glen to slow down, but he obviously didn't slow down enough and hit the side of our car." Windus was taken to hospital for observation and released later that day. With only four stages to go, the lead was cleared for Bates and Taylor, who finished first in Heat 2 by almost 20 seconds to Simon and Sue Evans. The Raymonds slowed down in the final few stages to ensure a podium place, still finishing third ahead of Eli Evans in fourth. This assured them the W.A. round win, with Eli second and Neal Bates third. They now sit in third on the ARC championship leaderboard, with the Evans's dropping to second behind Neal Bates and Coral Taylor. "To win the Heat yesterday for the first time and to come third today is fantastic - it's what we have been working for since we started rallying," said Glen Raymond. Justin Dowel could not consolidate his Heat 1 fourth place, rolling his Evo spectacularly on SS15 and escaping unhurt, but leaving the car on its roof. Brother and sister team Ryan and Rebecca Smart in their EVO IV finished the round in 5th - their best result to date - despite breaking a drive shaft in their first run and later suffering a flat. 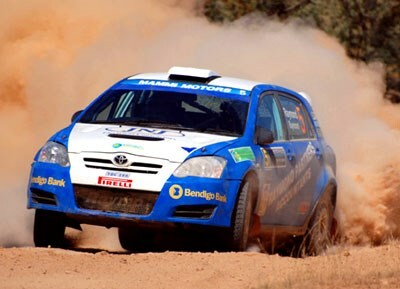 The next round of the Australian Rally Championship is scheduled for May 8 in Queensland.